From the dawn of time, people have sought the first hand experience of God. This yearning for a personal and transforming relationship to the divine is intense in the world today, yet virtually no book in the spirituality marketplace speaks so directly and extensively about the actual, literal, and entirely knowable experience of God's Presence and Being. Indeed, most writing on religion, spirituality, and mysticism describes the divine only indirectly - through the lens of the author's ideas and religious beliefs (e.g., Christianity, Buddhism, New Age) - reflecting far more of the lens than God. Written from first hand mystical consciousness, Ordinary Enlightenment, transcends experts, theology, and prescribed beliefs with the reader's own direct experience, for as Blake observed, "If the doors of perception were cleansed, everything would appear to man as it is, infinite." 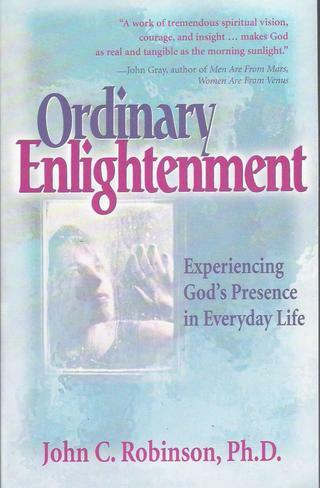 Topics in Ordinary Enlightenment that should excite the average spiritual reader include the surprising ways God's Presence leaks into our everyday lives, the profound breakthrough of Presence known as the "mystical experience" that can happen to anyone at any time, extraordinary insights about God and reality revealed in the Presence, what the experience of Presence is like and how to locate it, how the world returns to Eden in the Presence (and 21 observations from Edenic consciousness), the nature and experience of mystical union, 24 additional exercises for experiencing the Presence, the way Presence transforms suffering and evil, how ideas about religion actually separate us from God, and the physical and emotional healing that occurs in the Presence. It is indeed a mystic's handbook. Ordinary Enlightenment is a way of seeing the world that transfigures everyday life, literally teaching the reader how to experience heaven on earth. The kind of enlightenment available to ordinary people, it doesn't require a guru, years of spiritual practice, membership in a religious organization, or even a belief system. Rather, it is the direct perception of the surrounding spiritual world through easily learned mystical consciousness, revealing how extraordinary the ordinary really is. "Ordinary Enlightenment is a workbook for the soul...Robinson's manuscript is not just good reading - it's good practice." ForeWord Magazine: Finalist for Best Book in Religion from Independent and University Presses in 2000.